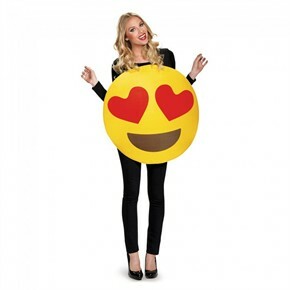 In this Heart Eyes Emoji Costume, be the most loved at the Halloween party! With this adult foam costume, you'll have fun while feeling super comfortable. Give everyone a good laugh, while you show off how loving you are. Gather your texting-loving friends to form an emoticon group costume idea. The foam costume comes in one adult size, and suits both men and women. Shirt and pants are not included. Availability: The Adult Heart Eyes Emoticon Costume ships in approximately 1 business day.